Add drama to your ensemble with this exotic gold coin necklace that features large panels with mirror inlays, coins, bells, and metal tassels. 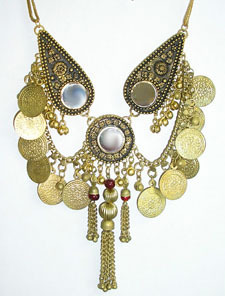 Add drama to your Belly Dance or Tribal ensemble with this exotic gold coin necklace that features large panels with mirror inlays, coins, bells, and metal tassels. Approx. 19.5 inches end to end. MADE IN INDIA. Matching Belt, Bra, Headpiece, and Earrings also available - see related items below. The necklace looks better than the picture. It matched perfect with the bra!